The Norfolk & Western Historical Society has an active, multi-faceted, and on-going publications program. All are encouraged to contribute! Membership in the Society includes a subscription to its quarterly magazine, The Arrow. This magazine has become one of the finest historical society publications of its kind. It is the only regular contact the Society has with each and every one of its members, so every effort is put forth to maintain its high quality and timeliness. Great effort is made to offer a variety of articles that span the history of the Norfolk and Western Railway, the Virginian Railway, and those roads merged into the greater N&W. Feature articles are welcomed from any who care to submit them. The articles do not need to be in final form: the Publications Committee can assist with editing and writing, if necessary. In addition to historical data, the magazine regularly features columns which highlight current news items on the contemporary Norfolk Southern as they relate to the former N&W, modeling information, and also a column devoted exclusively to the Virginian Railway. Articles may be submitted to The Arrow, PO Box 13908, Roanoke, VA 24038 or by email to TheArrow@nwhs.org. Guidelines for submitting articles are available here. Railroads generated a lot of printed materials, and the Norfolk & Western was no exception. These printed materials could be for company use, personnel training, public relations, shippers, or even corporate history. Many of these printed materials were done long ago and in small quantities. They contain a variety of information of special interest to the historian and researcher alike. However, locating these original materials can be difficult, and the asking price can be prohibitive. Beginning in 1994, the Society began to identify and procure railroad published materials that would be of interest to its members and the general public. Usually, these materials were published long ago and few, if any, copies were readily available. Working with the permission of Norfolk Southern, the Society has reprinted three booklets to date. These have been well received and as more materials are located and identified, more reprints will be produced. To date, the Society has reprinted sevreal items. All of these items are available for purchase through The Commissary. One of the Society's main directives is to preserve the history of the Norfolk & Western Railway and related railroads. What better way to do this than to publish original works that focus on various areas of the railway? Beginning in 1994, the Society made the effort to produce publications of historical significance that other publishers were not likely to print. Until that time, most books on the Norfolk and Western and/or Virginian focused on the motive power of the railroads. Although several well-done and worthwhile volumes on motive power were published (many of which are still available through The Commissary), the Society noted that there is a lot more to the history of the railroad than just the locomotives that pulled the trains. To that end, the Society has encouraged its members and others to develop original works related to various aspects of the railroad. 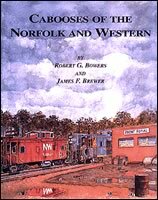 The first Society publication was Cabooses of the Norfolk and Western by Robert G. Bowers and James F. Brewer, published in June, 1994. This book details every class of caboose to serve on the rails of the Norfolk and Western, including those cabooses inherited from mergers with Virginian, Wabash, Nickel Plate and others. It provides complete rosters, dispositions, paint and stenciling information and a host of other material. 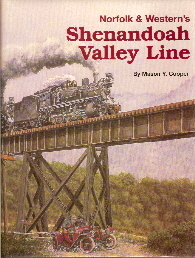 In February 1998 the Society published Norfolk & Western's Shenandoah Valley Line, written by Mason Y. Cooper. This book details the development of the Shenandoah Valley Railroad into what would become a significant route of the Norfolk & Western. The book traces the history of the valley from the development of canals and toll roads through the N&W merger into Norfolk Southern. Right-of-way, structures, motive power and rolling stock development, together with industrial and political events, are all detailed as to how they impacted on this valuable route. Although best known for its steam locomotive development, the Norfolk & Western turned to electric locomotives to solve operational problems in the coal fields that steam couldn't overcome. The development of the coal fields, demand for the best coal in the world, and the problems encountered in moving it from mine to market are all detailed in Norfolk & Western's Electrics by Mason Y. Cooper, published in August 2000. The development and building of the electric facilities and operations are detailed in this volume, as well as information on the locomotives and train movements. The demands upon the system during the war, together with the changing market for coal are well developed by the author who described how N&W once again became a "pure steam railroad" after the opening of the new Elkhorn Tunnel. The Society is constantly looking for original historical works for publication related to N&W and its merged partners. The Society can offer editorial and writing assistance, together with first rate layout and design. All pre-publication work is done in-house to insure the highest quality product. If you, or someone you know, has written or is considering writing a book on some aspect of the N&W, why not send it to the Society for possible publication? All manuscripts and/or inquiries should be sent to Norfolk & Western Publications Committee, PO Box 13908, Roanoke, VA 24038-3908. All Society reprints and original publications are available through The Commissary and your support is appreciated.